Life with Liv: Talking favourite holidays and being prepared at the airport. Talking favourite holidays and being prepared at the airport. After a lot of Friends deciding to go abroad for Christmas this year, my Husband and I have found ourselves reminiscing on past holidays. Our first together was back in 2005 when we had only been a couple for 6 months. We went on a bargain holiday to Bulgaria where it rained for 6 of our 7 days there, all our excursions were cancelled and we only got had enough sunshine for an hour in the outdoor pool the whole week! However we loved it. We had a great time together, talked got hours, ate/drank too much and still look back on it very fondly. Fast forward ten years and I'm not sure how fun it would be with an almost 3 year old to amuse! Times were very different then though and revolved around bars and restaurants not soft play areas and My Little Pony! As a couple we have been to a few different places and would sometimes go on a few long weekend breaks instead of an actual holiday. Once Liv was born we went to Haven in Lincolnshire for her first holiday, along with my Parents. We have been to the Dominican Republic with Family got my 30th Birthday, to Haven with 10 Family members and even to Florida for 3 weeks when Liv was almost 2 - thankfully the internet kept us in the good books allowing us to Facetime the Grandparents on the go - they were not happy we had taken little Miss away for 3 whole weeks I can tell you! My Husbands favourite holiday with his family was Disneyland Paris. My Mother in Law spent many hours entering competitions back then and was very lucky to win a Family holiday! 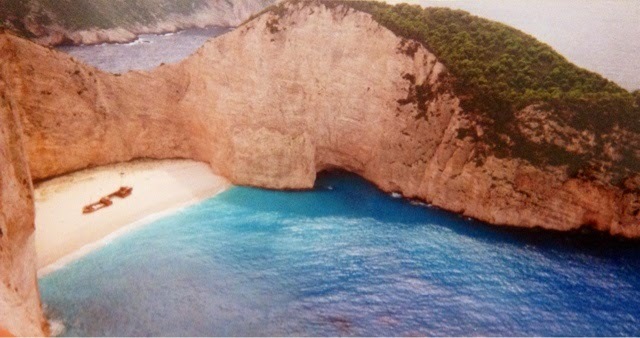 The holiday that stands out most for me was Zakynthos in Greece way back in 2002 with my Parents and Brother. It was our only family holiday abroad having always holidayed in Devon and Cornwall as a child. I remember the weather being amazing and the people being ever so friendly. Some of the views were spectacular. My favourite excursion was out to the Navagio (shipwreck) beach in Anafotiria Village. It is the most beautiful sight. It's an exposed cove which holds the wreckage of the Ship Panagiotis which was wrecked on the beach while allegedly smuggling cigarettes in 1983, giving it the nickname "Smugglers Cove". Isn't it beautiful? The limestone cliffs and sparkling, clear blue waters surrounding the shipwreck make for a must see if you are in the area. It really fascinated me. I would definitely take my little Family back. It would be interesting to see how it has held up over the last 12 years or so. Also thinking back, flying has changed so much since all of these holidays. Right from the security checks to what liquids are allowed in your hand luggage. While these things are pretty uniform across all airlines, things like luggage size and weight are specific to each individual airline, so it best to check and follow guidelines before you are held up or even charged extraordinary amounts at check in. Another option I have recently found is storing some items with left baggage, this is a service where you can safely store heavy or precious items while you go travelling, what a brilliant idea! Where was your favourite holiday? *Disclaimer - this is a collaborative post.